After buying the Project Manager start the 3ds Max and install the plugin. 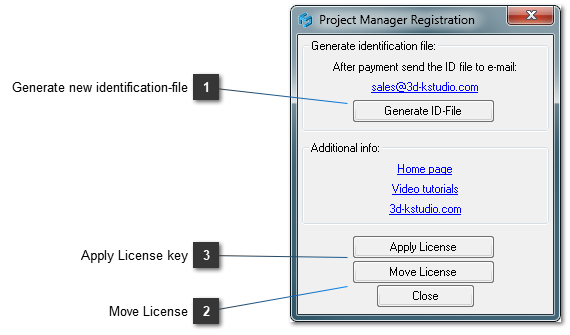 For starting the registration choose the item "Activation" in the main 3ds Max menu "Project Manager"
or run the Project Manager and choose the item "Activation" in the menu "Help". For generation the new identification file press the button "Generate ID-File". After open the dashboard and send the identification file. During from 2 up to 48 hour you will receive the new license. In case if you update your computer, reinstall the Windows or by any other reason your license stop working you can update the license key for free. 1) Run the “Registration” tool and click the “Move License” button. Choose from the opened window the license used previously. The request for the transferring will be automatically sent to the server. 2) Run the “Registration” tool and click “Generate ID-File” button. Login and send the identification file using dashboard. During one hour you will receive the new license. After receiving the license key press this button and choose the license key. where you plan use the plugin. Please use your permanent e-mail box (same as you use at purchasing). You can always restore the password on the page Restore password.